This show consists of 45 minutes of magic, in which Zippy Junior uses a live rabbit in his performance, and gets both the adults & children involved in his show. He also gets the children up to assist him in his performance, focusing on the birthday child throughout the show. For the remaining 10-15 minutes, he will make all of the children at the party a balloon animal to take home, and always makes the birthday child a larger balloon animal. He will also provide some photo’s of himself & the magic rabbit for the children to take away & colour in. There is no limit to the number of children that you invite. Zippy Junior will also provide the invitations for your party! This show is suitable for ages 2-7yrs. The 2hr show is by far the most popular, and totally stress free for you! All that you have to do is provide the food, and Zippy Junior will do the rest! The first hour of the show consists of approximately 45 minutes of magic, in which Zippy Junior uses a live rabbit in his performance, and gets both the adults & children involved in his show. He also chooses some of the children to assist him in his performance whilst maintaining a focus on the birthday child. It then works best if the children are then seated for their food. At this point, Zippy Junior will prepare the party games and balloon models for the 2nd part of the show. After the party food & singing “Happy Birthday”, Zippy Junior will provide a fun packed hour of games, dance routines & competitions for the children. Zippy teaches the children all of the popular dance routines such as Superman, the Music Man, Hokey Cokey, Choco-Late, Chu Chu Ah, Veo Veo, Star Trekkin’ and many more. Zippy Junior will also provide some small spot prizes for the children in the 2hr party package. No games are played where the children are ‘out’. Zippy Junior also includes a limbo competition in this show! There is no limit to the number of children that you invite. Zippy Junior loves to entertain, so the more, the merrier! Zippy Junior will also provide the invitations for your party! This show is suitable for the age groups of 2-7yrs. Zippy Junior’s Circus Workshop begins with a quick demonstration of all of the skills on offer, along with an introductory lesson on how to perform the skill. The different skills are then placed at particular locations around the room or hall. The children are then divided into groups, and then sent to the location where they attempt the skill. After a short duration, they are then asked to move to the next area to attempt the next. The children will always get to attempt every skill at least once, and once completed, Zippy Junior then gives them a chance to demonstrate what they have learnt to their friends & family. Zippy Junior’s Circus Skills include: Juggling Balls, Juggling Silks, Juggling Hoops, Plate Spinning, Diablo Throwing, Devil Sticks, Stilt Walking & Balloon Modelling. The Circus Skills Workshop is not suitable for houses. We recommend this package in a large hall, for the age group of 5 & over. Zippy Junior regularly provides this package for the local schools in the area, which is provided for by the council, and regularly performs for large organisations, such as Sure Start. Zippy Junior will also provide the invitations for your party! Zippy Junior also offers Balloon Modelling workshops. He teaches the children and adults how to make simple balloon designs such as a dog, cat, parrot and sword. These workshops are available for anywhere between 1 & 3 hours, and work particularly well at Birthday Parties, Christenings & Fetes. Zippy Junior provides all of the high quality Qualatex balloons, pumps and designs for all of the Children to get modelling. There is no limit to the number of children that you invite. Zippy Junior will also provide the invitations for your party! Zippy Junior offers a Magic Workshop, which was introduced in 2007. 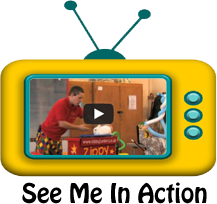 In this package, he teaches the children a selection of tricks to both adults & children. This is available in either a 1 hour or 2 hour package. He can teach the magic class at either your home, classroom or village hall. Zippy Junior finds this package a lot more effective in smaller groups, so that he can teach more effects in each class, but has done lessons in the classroom for up to 30 children in the past with great success. The magic that Zippy Junior teaches is always specific to the age group. If performing for younger children, then he will teach simple tricks that are easy to perform. The older children will prefer the tricks that are slightly more complex. Zippy Junior will also provide the invitations for your party!